It isn't really something that I have mentioned here on IC2S, but I absolutely love the Pokemon franchise, particularly the flagship handheld games. I have many fond memories of getting ahold of a classic Gameboy, playing the first two generations of games and managing to catch the first 150 Pokemon in my copy of Pokemon Blue*. Like most people who were there from the beginning, I missed quite a few of the later generations as I grew up and took interest in other things. However, like some of the finest things in life, maturity only rekindled my love for these creatures and in the past few years I have become a bigger fan of this series than I ever was as a kid, playing just about every main game in the franchise at least once at this point and proudly rocking a living Pokedex. Of course, I'm the Retrospectives guy, I love collating my thoughts on a franchise in a digestible fashion. While I'm not going to go and do a full-on Retrospective for every game in the Pokemon franchise, I will go into some of my thoughts on each of the 7 generations, specifically the things that I love and hate about each. So, without further ado, let's move on to my thoughts on the first generation. Creature Design - It should go without saying that the original 151 Pokemon are classics, in part due to nostalgia, but even at the time they were strong enough to kick-start the franchise's popularity. There is a class of Pokemon fan dubbed "genwunners" who never grew beyond the first or second generation and which believe that everything was best in this generation; admittedly, fans like this lionize the first gen's designs a bit too much (for example, Exeggcute, Electrode and Dugtrio's designs are about as dumb as much-maligned later Pokemon, such as Garbodor or Kling-Klang, for the exact same reasons; in addition, a number of Pokemon are literally just real animals, such as Krabby or Seel). Established the Formula - If you've played the original Pokemon games, then you will definitely recognize that every subsequent Pokemon game is simply building on the skeleton established by these releases, as the whole concept of capturing Pokemon, the battle system and world navigation have remained largely intact. It's a legitimately enthralling formula, which is why it has remained this way for so long. Following Pikachu - While having Pikachu as a starter Pokemon in Yellow is actually awful as it is so much weaker than any other starter Pokemon and can't evolve either, the ability to have Pikachu follow you around is such a nice quality of life feature which makes you actually want to use the underpowered rodent. Considering how often it is requested, it's surprising that this feature was only brought back once since. The Psychic type was incredibly overpowered, being only resisted by other Psychic types and being weak only to the very underpowered Bug type. To make matters worse, Ghost types were supposed to be super effective against Psychic, but due to poor programming, Psychic types were made immune to Ghost attacks (seriously). Even if it had been programmed correctly, the only Ghost attacking move was very weak and the only Ghost Pokemon was also part Poison, which is super weak against Psychic attacks. Dragon types only had one attack, the fixed-damage move Dragon Rage, meaning that they could never be super effective or take advantage of STAB (same type attack bonus, which gives a 1.5x attack multiplier if the Pokemon possess the same type as its attacking move). Critical hits and one-hit KO moves were based on the Speed stat, meaning that you could manipulate this stat to guarantee these would land every time, allowing players to cheese their way through the game. All moves are classed physical or special based on the type (eg, all Fire attacks are special, even Fire Punch, and all Ghost attacks are physical). Furthermore, while physical stats are split between Attack and Defense, the special stat is only one value, meaning that a Pokemon with a high Special stat will be both specially offensive and defensive. This only compounds with the overpowered nature of Psychic types, which have high Special stats in general. Against certain Pokemon, particularly legendaries, Poke Balls will miss. The only solution to this is to weaken the Pokemon as much as you can, hit it with a status move and then just keep chucking balls until the game decides that they stop missing. It might take 10-15 balls to do so, but it's a serious annoyance. Some moves just plain don't work as intended, such as Focus Energy, which is supposed to increase your critical hit ratio, actually cuts your critical hit ratio by 75%. 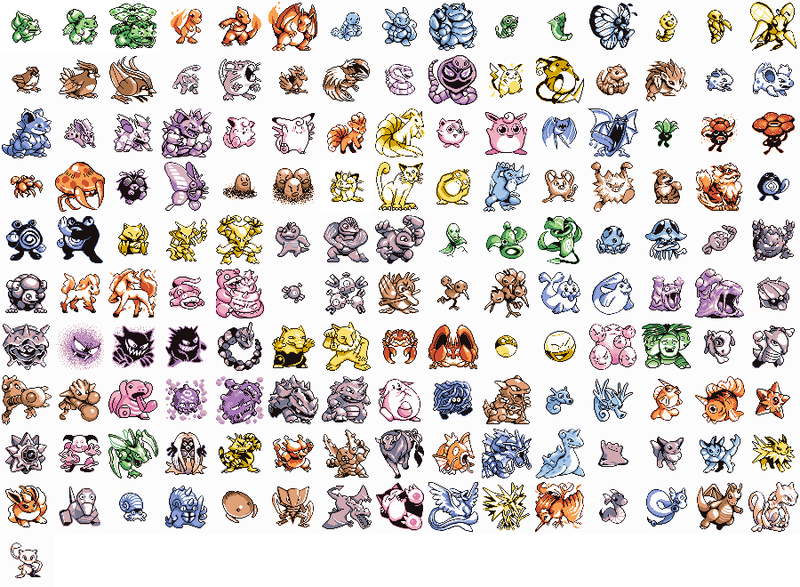 Awful Sprites - In Red and Blue, some of the Pokemon's sprites are just plain ugly. 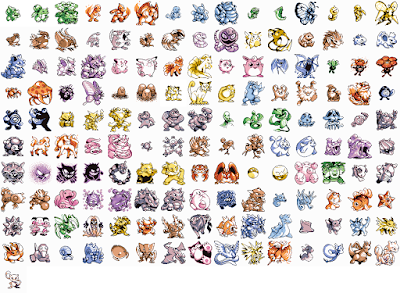 I mean, just look closely at those sprites in the Generation 1 heading above - they're so bad. Blastoise looks bloated, the perspective on Seaking is super awkward, Eevee looks sinister rather than heart-meltingly cute, and what the hell is going on with Golbat!? Hell, even Pikachu, the freaking series mascot, looks incredibly derpy. Thankfully this issue was rectified in Yellow, which featured new sprites for many of these Pokemon (which is actually probably the best feature introduced in Yellow, in my opinion). Clunky Pokemon and Item Management - Having to switch boxes to capture Pokemon is a pain, especially because you only can carry 20 in a box and the game does not warn you when it is about to fill up. As a result, you can easily get screwed out of a Pokemon you wanted because your box was full and you didn't change it. On a related note, you can only carry a small number of items at a time, meaning that you're going to be constantly storing and swapping items at your PC (which also has a finite space available, because of course it does), or constantly tossing items in order to pick up valuables you find along the way (having recently played Yellow, this was one of my biggest barriers to enjoyment). Poor Map Design - While the region of Kanto is itself is laid out in an interesting fashion, giving players options to tackle the gyms out of order if they can overcome the level differences, most of the individual areas are very poorly designed. I had completely forgotten this aspect of the game in my recent playthrough, which made navigating any area a bigger headache than it should have been. The game has lots of open, unused spaces (such as Viridian and Pewter City), meaning that you can often have absolutely nothing of interest on screen while navigating. Caves are also notoriously annoying in this way, since they're almost always flat and open (Mt. Moon is particularly egregious in this regard). Furthermore, in caves you're often far away from a Pokemon Centre so you NEED to have tons of healing items to avoid blacking out (which compounds with the item slot restrictions). Rock Tunnel is especially pronounced in this regard, because the entire route is flat with no shortcuts to turn around if you need to stop and heal. Even some of the regular routes are just gruelling slogs to push through, such as the path from Lavender Town to Fuchsia City, which features 4 long routes to get through. The result of all of this is that generation one games just feel like a gruelling process to push yourself through at times, especially if you've played any subsequent game in the series. Tune in soon for the next entry where I'll cover Generation 2. *Before my asswipe of a "friend" started a new save file on my copy without asking, thereby wiping out all of my Pokemon.